If you are wondering what to do with that basket of wine corks in your kitchen, consider a wine cork craft project. Craft projects are a great way to recycle wine corks and indulge your creativity. Wine corks are an excellent material for crafting, no matter if you use an old fashioned "cork" or you use corks made out of newer materials. Cut into pieces, wine corks can be used to create a simple but funky bracelet and necklace set. Use the knife to carefully slice the corks into thirds, horizontally. Screw an eyehole screw into the center of each end of a cork until only the eye is visible. Link together the cork pieces with a jump ring between them to create the bracelet and then the necklace. Attach the clasp to each end of the finished pieces. Be sure to adjust for size before adding the clasp; add more or fewer cork pieces to get the desired lengths. Use this fun wreath to welcome guests at any time of year. Decorative touches such as raffia, dried or fabric flowers, dried moss, etc. Wrap a piece of tape around the top section of the wreath form. Wrap a piece of wire over the tape with a length extending upwards about 4-inches. Twist the ends of the wire together at the top. This will be used to hang the wreath, taking the weight without damaging the form. It will be covered with ribbon or fabric to hide the wire. Slice each of the corks in half horizontally. Attach the cork pieces cut side down to the wreath form using hot glue. Work the cork pieces around the wreath form so all sides and edges of the form are covered. Add decorative touches (flowers, ribbon, etc.) if desired to fill in any gaps, or to make the wreath more interesting. Cut a piece of ribbon or fabric to the twice the length you want the wreath to hang from. Pass one end of the ribbon around the top of the wreath so the wire it will hang from is hidden inside the wire. Hang the wreath by the wire and pull the ribbon up tight to give the appearance that the wreath is hanging in this more decorative way. 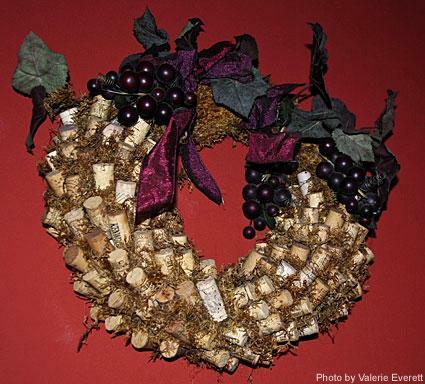 Garland: Make a holiday garland with wine corks as a fun way to recycle the corks and remember special occasions associated with the wine. Use the same screw and jump ring method used to make the bracelet and necklace to create a long and positionable garland. Coasters or trivets: Cut each cork in half and create a flat design such as a flower, sun, square or oval with a pattern. Glue the cork pieces together in the desired design. Jewelry: Cut or shape wine corks into beads with patterns to create necklaces and bracelets. Add accent beads to the jewelry for unique designs. Refrigerator magnet and message board: Create a message board by gluing pieces of cork to refrigerator magnets in a decorative design. Use thumbtacks to hold messages in place on the magnet. Stamps: Carve a design such as a small pattern, shape or a letter onto the bottom of a wine cork to create a stamp. Cork stamps work best with paint. Birdhouse decoration: Slice pieces of wine cork and paint them. Glue the painted pieces to a birdhouse. Knife holder: Glue a number of corks together to form a knife holder. Cut an opening in the holder for the knife rest. Place card holders: Cut a slit into a flat-based wine cork and insert a small place card. The cork will hold up the place card. Beaded curtain: Drill a hole into each cork and string them together in patterns to create beaded curtains that can be used in doorways or as a room divider. Use decorative beads with the corks to create beautiful designs. Wine Intro: The Wine Intro site has advice for using wine corks in crafts. Crafters Love Crafts: The Crafters Love Crafts site has instructions and advice for wine cork crafts such as trivets and stamps. Dr. Vino: Check out this inspirational site for 10 projects that involve corks, including chairs and doll houses. The Crafty Scientist: Another round-up of fun craft projects including boats and pens. There are wine cork projects available for every skill level. If you have a wealth of wine corks in your home, consider turning them into art or home decoration with any of these crafty projects.